Matthew Gibney Catholic Primary School welcomes all new families to our school community. It is our hope that all the children will enjoy learning and be proud of their accomplishments. 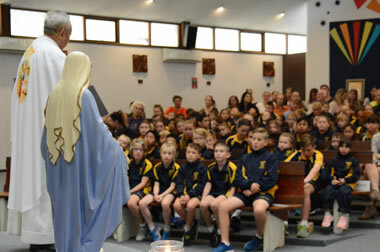 Matthew Gibney Catholic Primary School is a school dedicated to making a valued difference in the lives of our children. We trust that when people look back at the time spent in our school they cherish fond memories of a genuine and faithful community, ‘Under God’s Protection’ always. Our school Parish Liaison person is Amber David.